Edmonton, Alberta--(Newsfile Corp. - November 30, 2018) - Benchmark Metals Inc. (TSXV: BNCH) (OTCQB: CYRTF) (WKN: A2JM2X) (the "Company" or "Benchmark") is pleased to announce results from Benchmark's inaugural 2018 drill program at its Lawyers Gold & Silver Project, located in the Golden Triangle region of British Columbia, Canada. 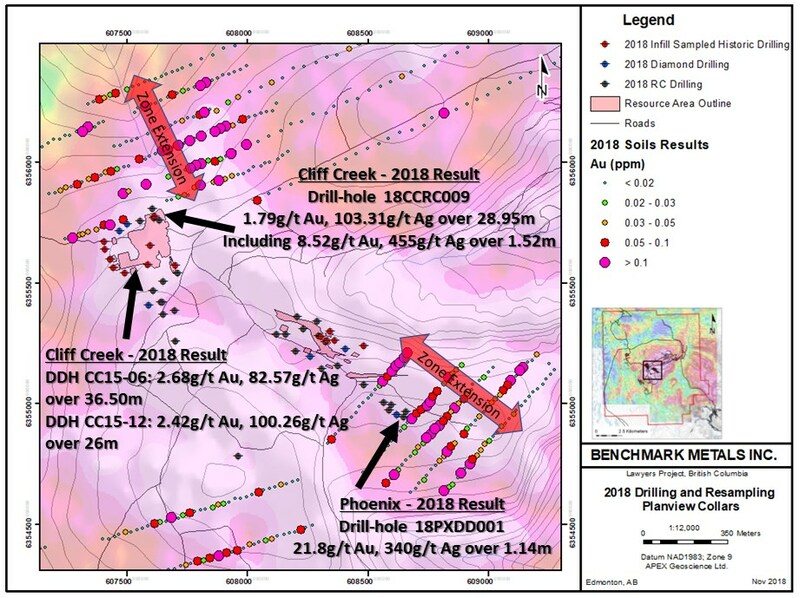 The initial drill-holes demonstrate the existence of new high-grade targets at the Phoenix Zone and the potential to significantly expand the mineral resource at the Cliff Creek Zone within the first year of operations. CEO John Williamson commented, "Benchmark continues to provide outstanding gold and silver results. The inaugural drill program shows bulk-tonnage, near-surface intercepts at the Cliff Creek Zone that envelope higher-grade intervals of gold and silver. The Phoenix Zone has provided a high-grade drill intercept that correlates to high-grade samples at surface." The Lawyers Property and formerly producing Cheni Gold and Silver Mine is located 45 km northwest of the Kemess Gold and Copper Mine. The Property contains an existing Mineral Resource and hosts at least 16 gold and silver occurrences that were never fully mined, developed or explored. The 99 km2 prospective land package presents a unique opportunity for Benchmark to carry out exploration on a 'camp' scale. There remains excellent potential for the discovery of additional low and high-sulphidation epithermal precious metal deposits like those that have been discovered and explored to date in the Golden Triangle region.